The Northern Virginia Fine Arts Festival, now in its 28th year, is one of the "top five" outdoor art festivals in the country with a long-standing reputation for showcasing high-quality hand-crafted, one-of-a-kind artwork in a dynamic outdoor setting that draws affluent and knowledgeable clientele. It is Greater Reston Arts Center's largest annual fundraiser. 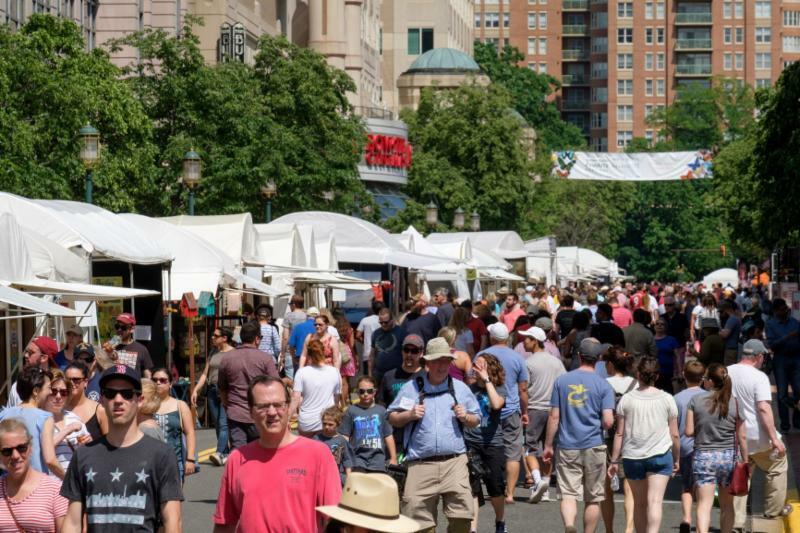 The 2019 Northern Virginia Fine Arts Festival is a three-day juried event, with a sophisticated buying audience located in the unique outdoor shopping destination; Reston Town Center in Reston, VA an affluent suburb of Washington D.C., ranked #4 of the wealthiest counties in America, by Forbes Magazine! The event attracts art lovers, affluent homeowners, corporate executives, and design professionals in addition to the broader community. Our highly-anticipated cultural event draws up to 30,000 visitors and there is FREE garage parking all Festival weekend courtesy of Boston Properties. This year we are pleased to announce the following changes to give our artists the best possible show experience. These unprecedented changes are a direct response to the comments and suggestions we have received from our artist surveys. We are committed to elevating the profile of our Festival and reach new audiences. To that end we've made a contract with a professional public relations firm to develop an aggressive marketing and promotion campaign to better market, recognize and celebrate our Festival artists. We also have a strong outreach campaign for social media, radio, and television, which includes both paid and trade advertising. We negotiate for well-placed advertising in prominent magazines and newspapers, arts focused catalogs, and online Going Out Guides. Has anyone had success at this show (Northern VA Fine Arts Festival)? Is so in what category and what price range? Please search for this show on this site, Len. It is in a great neighborhood and there are many happy artists. See what you can find.